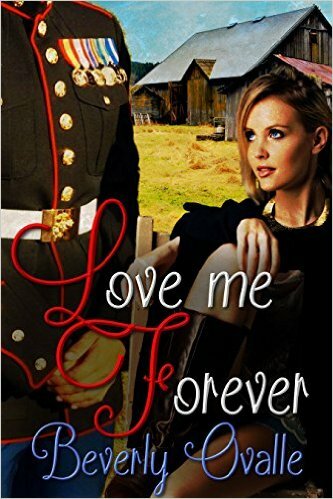 In Love Me Forever we meet Abby Worth and Staff Sgt Liam McGregor. Abby has graduated as a Physical Therapist and is trying to decide if she wants to continue with her schooling to get her doctorate. Meanwhile she is working with the VA as a PT and has gotten a new case, a live in case that should last til her next semester starts. She heads into the office to get the specifics and paperwork of the new patient. She is shocked to see her older brothers best friends sitting there in the hospital clearly hurt. What drove Liam away when he was 22? There was a 14 year old beautiful little sister of his best friend. He had feelings for her, real ones but she was 8 years younger and if he's right she had a crush on him too. He could not let anything happen, he had to go, she was way too young for him. But then he loved the Marines and was happy and stayed. He planned to put in his 20 years and retire to take over his family ranch. Unexpectedly he is hit by a road side bomb and luckily he survived but he has a long road to recovery. And it looks like his baby girl Abby is just the woman to get him there. This is a perfect book if you are looking for a short sweet read with little angst. It's sweet and a romance, a little more YA then I thought going into the book. I really did enjoy the book but it was way to short for how it was written. You have a small window when you are writing a novella to hit the right amount of character development. To me when I read a book of this nature I need it to be direct. Abby and Liam don't talk to each other about what's going on between them til important life decisions. The book was so much about his therapy which would be fine if they spoke to each other, not just flirt mindlessly. But at the same time I did really enjoy the books.